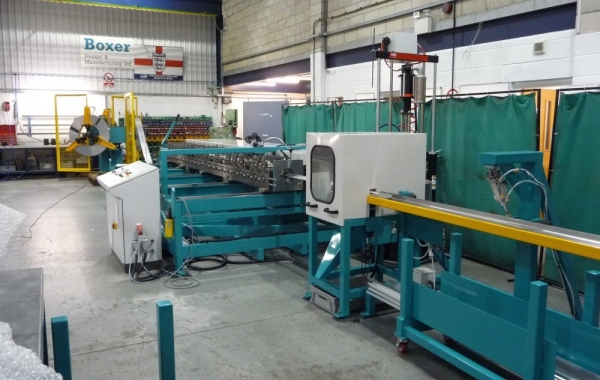 This line of machinery is capable of producing three profiles: 20mm Slip-on Flange (0.6/0.7) thick; 30mm Slip-on Flange (0.7/0.9) thick; 40mm Slip-on Flange (0.9/1.2) thick, from 1000kg coils of galvanised mild steel in cut lengths from 100mm to 5 metres. 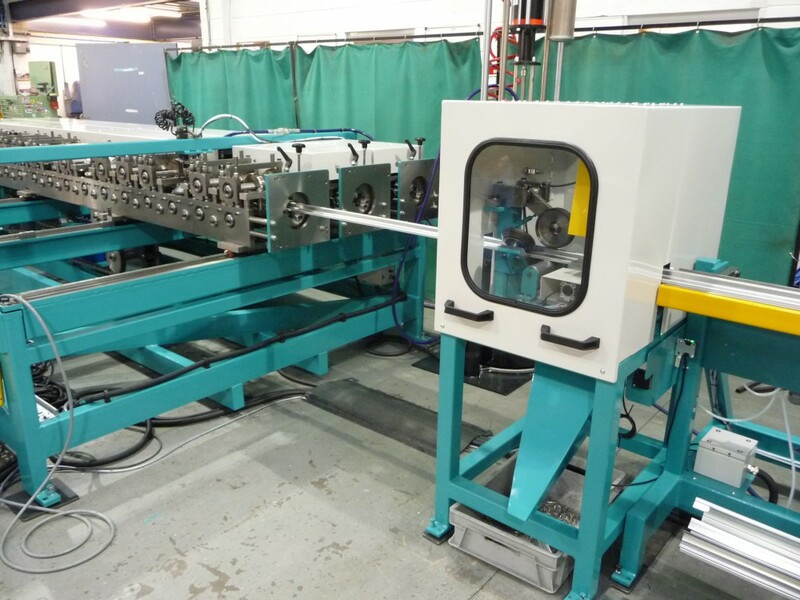 The production rate is length dependent, due to the cut cycle, but is approximately five components per minute at 3-metre long. 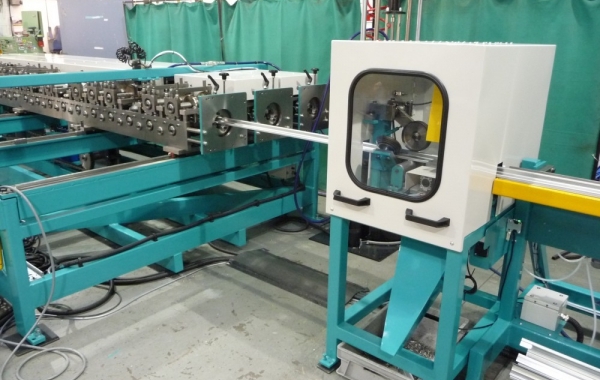 A sealant injection system is incorporated into the rollforming machine to inject sealant into the pocket of the flange profiles when required. 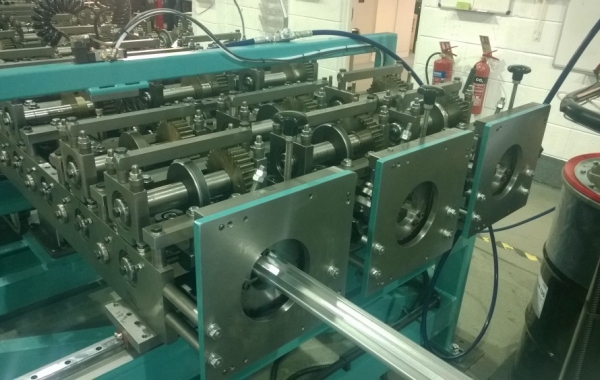 1000kg capacity Triple Head Motorised Expanding Mandrel De-Coiling Machine to suit coils of 275mm to 520mm diameter bore x 1250mm outside diameter x 300mm maximum width. 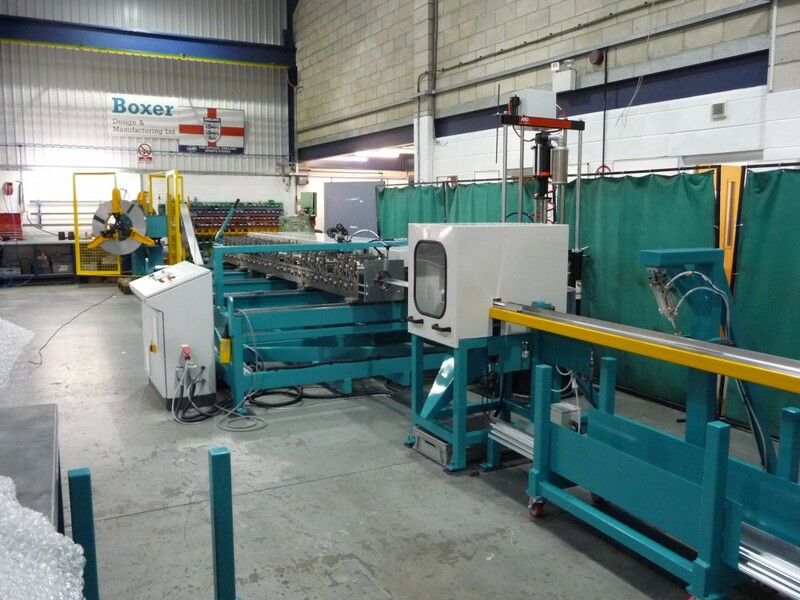 Each mandrel is expanded by manual crank handle, and is driven by inverter-controlled geared electric motor, with contactless loop control to control the pay-off speed. The three-sided headstock pivots manually to one of three positions, each aligning the required coil with the relevant rollforming head. 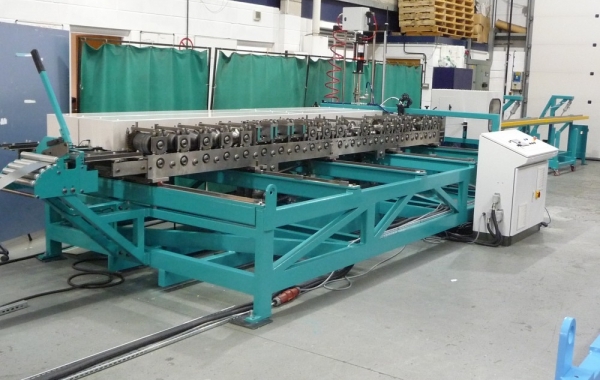 Model S23.13 – 20 station 230 horizontal x 128mm vertical centred Rollforming machine, tooled for the 30mm flange profile inboard, between side plates spaced 220mm apart, on 40mm diameter withdrawable roll shafts. 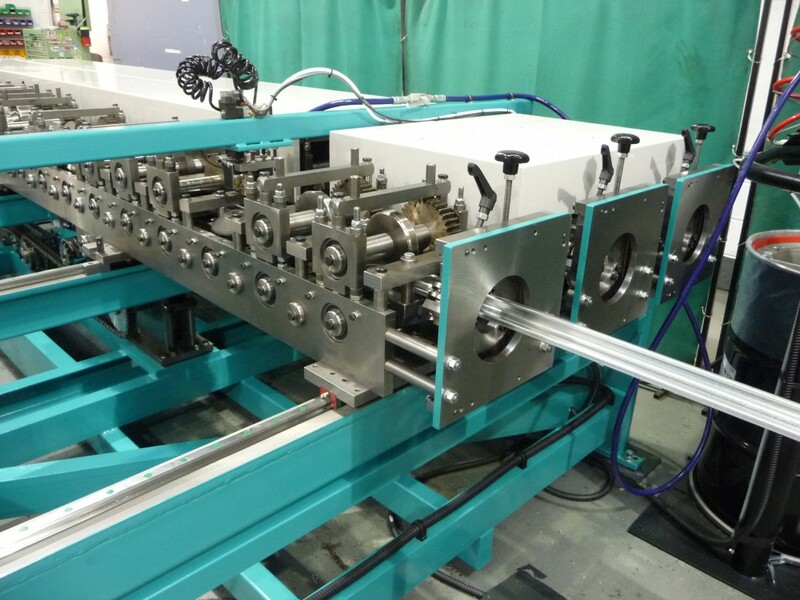 Numerous free-running side rolls assist in forming of the profile at the latter forming station. The lower roll shafts are carried within sealed-for-life deep groove ball bearings in the rigid one-piece side plates. 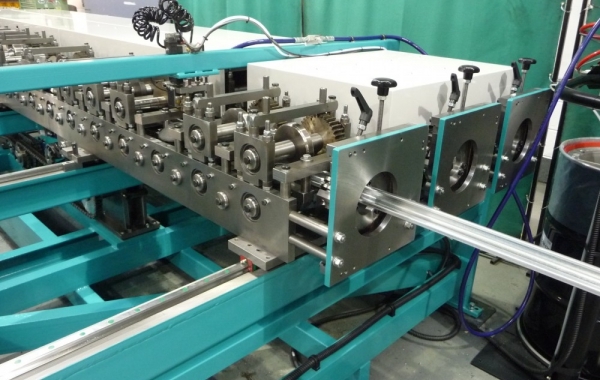 The top roll shafts are similarly carried within upper bearing blocks, individually adjustable for roll centre and forming pressure, utilising ‘disc spring’ stacks. Bottom and top roll shafts are driven by hardened spur gear train via idler gears, carried by sealed-for-life deep groove ball bearings, on the lower withdrawable idler shafts. 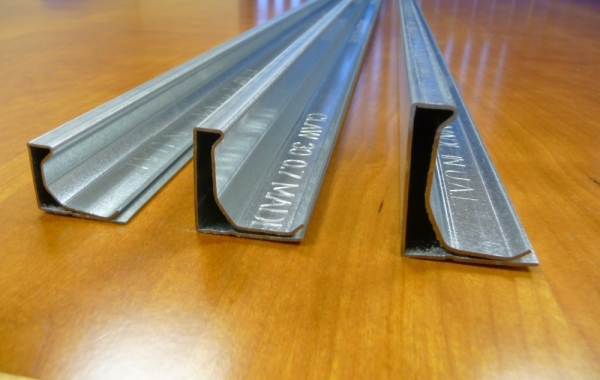 These shafts connect the side plates, thus creating the rigid head assembly and allow ease of individual removal for maintenance. 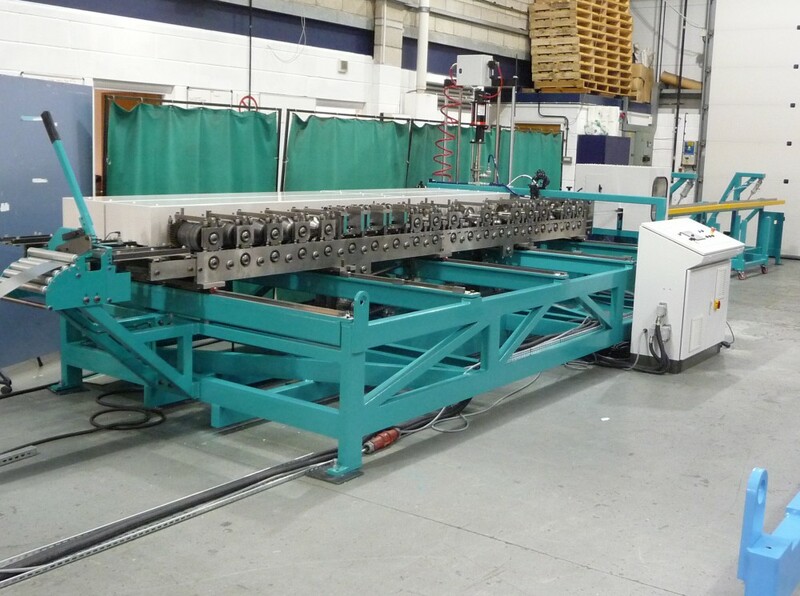 Two similar heads are carried side-by-side for the forming of the 20 & 40mm flange profiles. 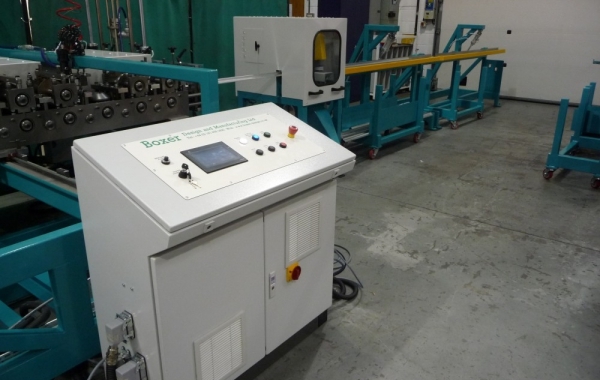 The machine is driven at a speed of 25 metres per minute, by means of an 11kw inverter controlled geared electric motor, and dual heavy-duty chain drive to the rolling head splined drive shafts. These shafts drive the gear trains of the three forming heads via bearing mounted gear sleeves. 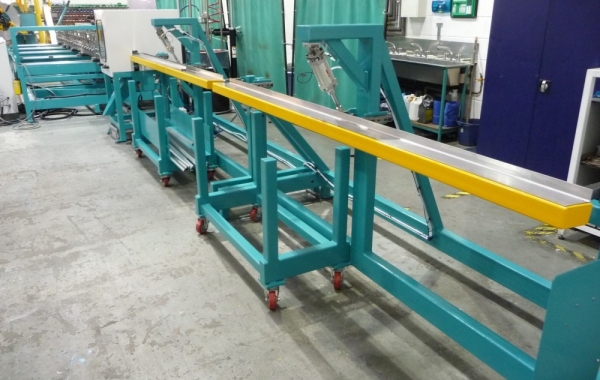 Hardened, adjustable in-feed guide bars and coil support roller are fitted to the in-feed end of each of the rolling heads, which are carried on the cross beams of the totally guarded, robust, fabricated base frame, with fixing and levelling points. 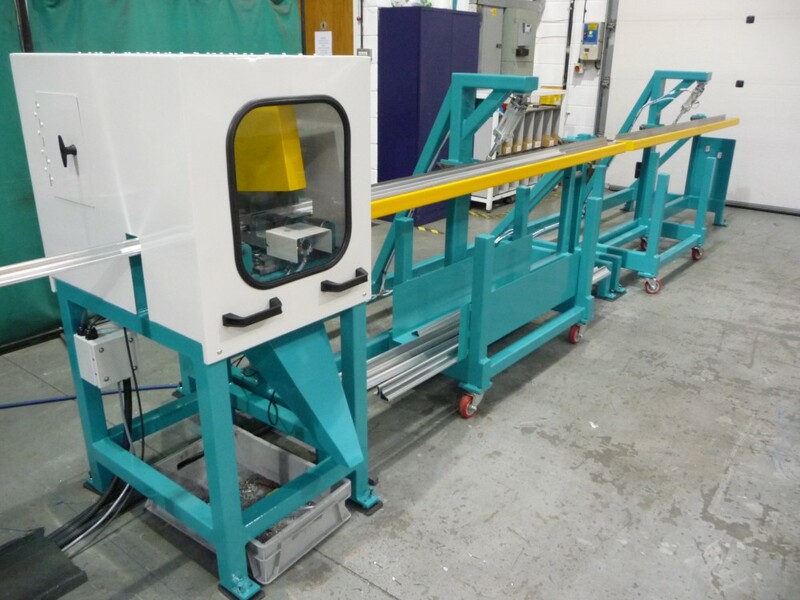 Dual three-way adjustable ‘Turks Head’ exit-straightening dies are fitted to each head to correct any vertical, lateral and torsional product deviations. 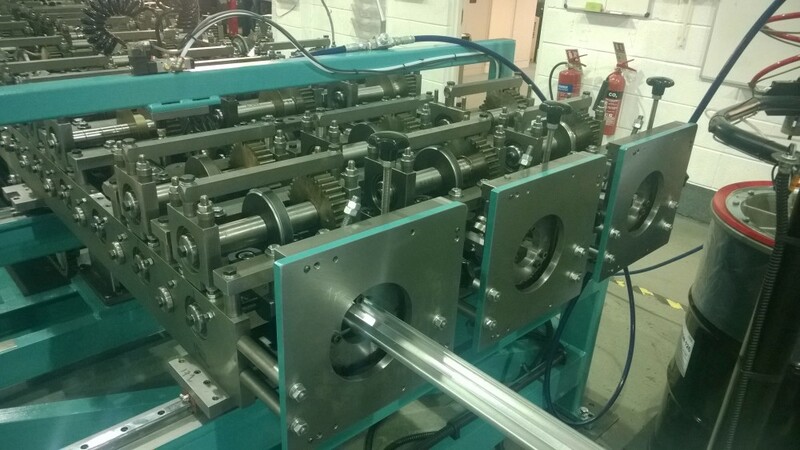 All three heads are tied together and mounted on linear bearings for ease of product change. Once the required head has been manually aligned with the cut-off, it is simply held in position by dropping two T Bar dowels into location holes. 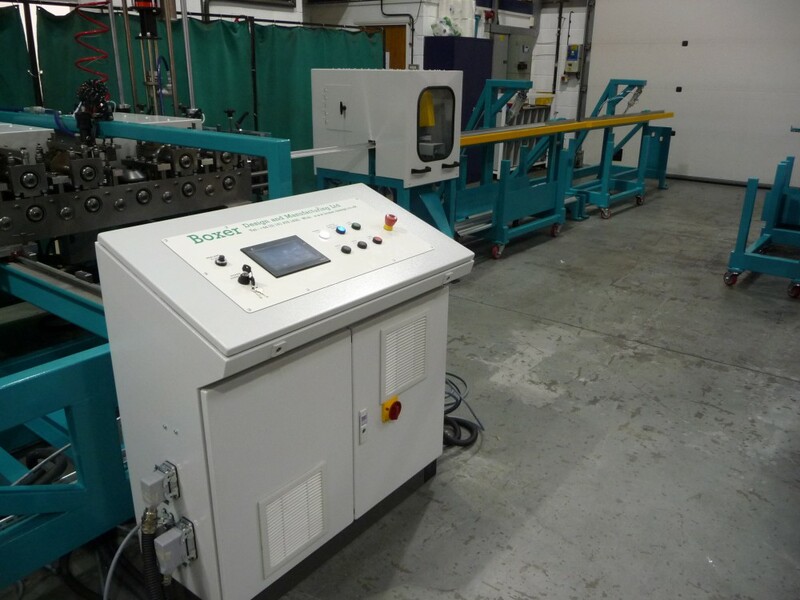 A sealant injection unit pumps non setting sealant from 205 litre drums and injects it into the 20, 30 & 40mm profiles during the rollforming process via solenoid control valves. 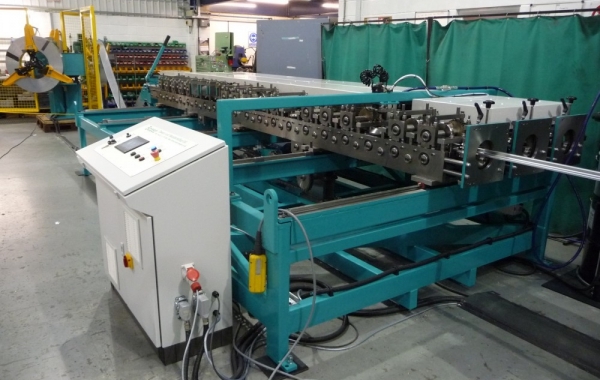 The flow is automatically ceased and started via material sensors and when stopping to cut. The pneumatically actuated, high-speed pivoting saw head incorporates hydrocheck speed control, adjustable to give optimum saw blade life. The saw blade is also carbide tipped for maximum life and driven at 2000 rpm by means of a 0.75kw electric motor. 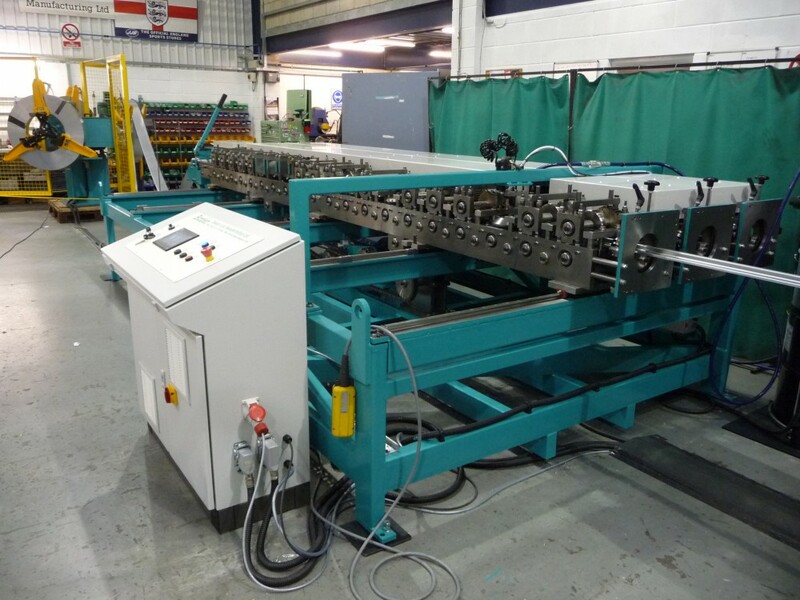 The machine incorporates precise pneumatic clamping of the profiles to provide vibration free cutting. 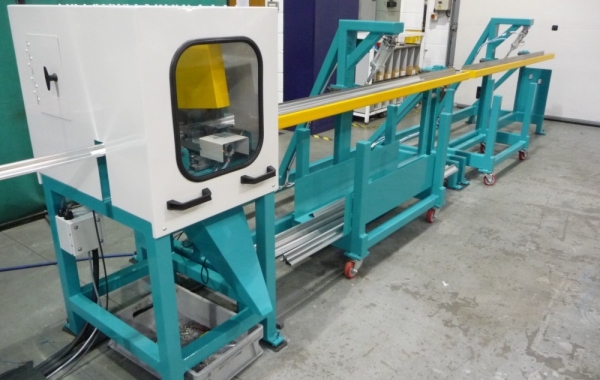 The 5-metre long pneumatically activated Drop-Flap drops the components into one of the two trolley units provided, which hold a 600mm depth of completed Vane profiles when a ‘trolley full’ sensor arrests operation of the line until removed. 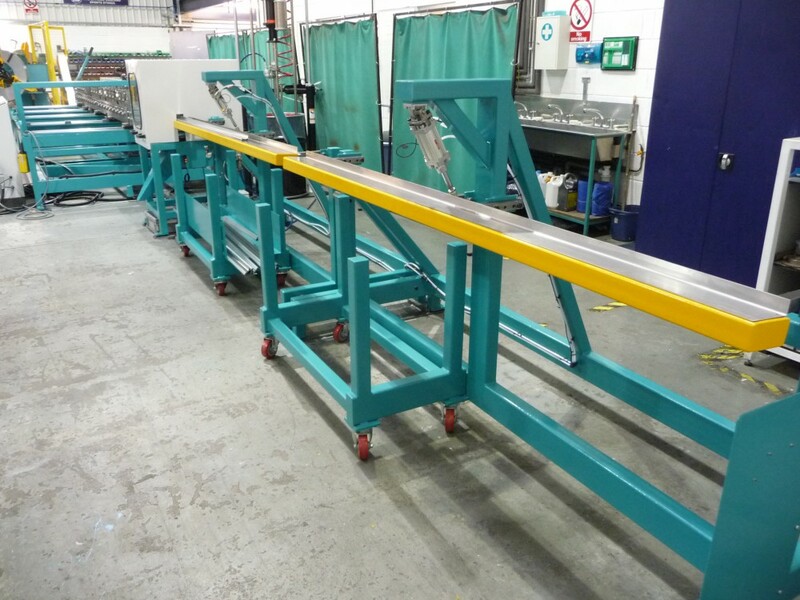 The trolley design allows for bundle tying and fork truck access. The electrical control cabinet mounted at the side of the machine contains all necessary electrical hardware including the fully programmed microprocessor PLC, intelligent inverter drives and all related contactors and relays. The cabinet top surface carries the simple operator controls, consisting of power ‘on’ and ‘off’ pushbuttons and illumination alongside the operator HMI. This touchscreen display unit provides prompted entry of the desired component, length and batch quantity. 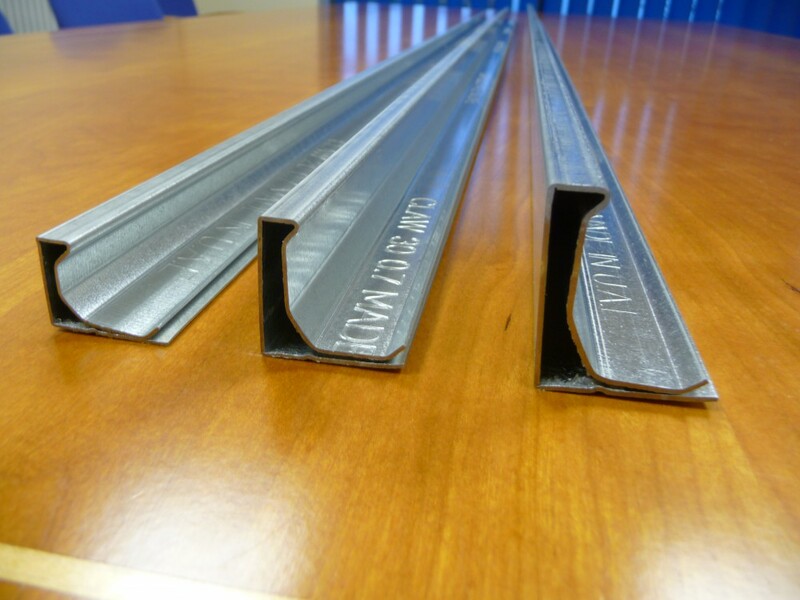 The length is restricted to a range of 100mm to 5 metres. The product type is automatically selected by a sensor on the active forming path. The unit also provides adjustability of various length related parameters, display of alarm messages to simplify fault finding and a ‘metre total’ count of throughput per product.